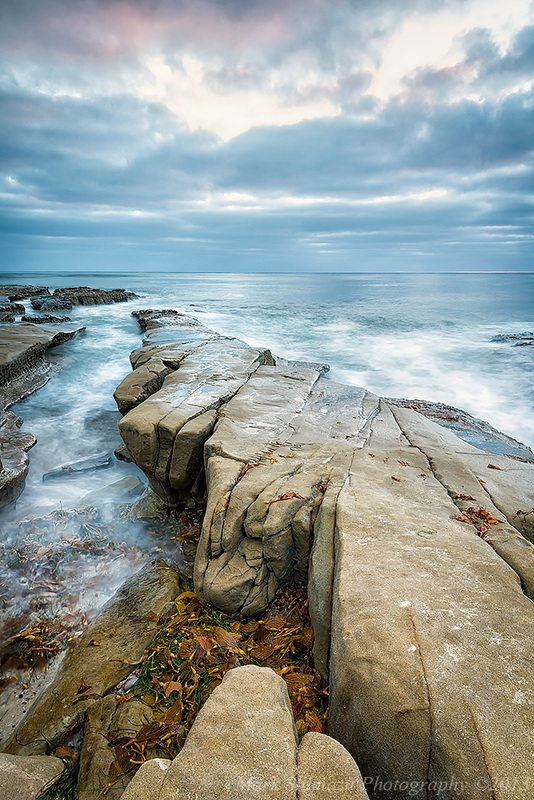 One of the places I like to shoot most is the La Jolla coastal areas. There is no shortage of unique rock formations which make for interesting foreground objects. I have quite extensively shot the coastline from La Jolla Shores down to Windansea, but I have somehow managed to miss this particular spot until this past weekend. I must say of all the spots along the La Jolla coast, this one is the most interesting and dramatic. Like almost all landscape shots, the best time to shoot is either 30 minutes before sunrise/sunset or 30 minutes after sunrise/sunset, or the so called Golden Hour. During this time you get great color and direction of light as well as avoid the overly contrasty conditions of shooting during the middle of the day. Must have equipment to successfully shoot during these times of day are a sturdy tripod and a set of graduated neutral density filters. The tripod is necessary due to the long shutter speeds you will be using due to the low amount of light during the Golden Hour and the large f-stops typically used in landscape photography to get the entire scene in focus. The graduated ND filters are necessary to balance the exposure of the foreground with the bright skies. Due to the limited dynamic range of even today’s best sensors, shooting these scenes without a graduated ND filter would result in either a blown out sky or an underexposed foreground. An alternative to using filters is HDR or High Dynamic Range techniques of blending multiple exposures into one. I like to get my images in one shot and get it right in camera, so elect to use filters instead of HDR, but either technique will give great results when performed properly. I was drawn to the composition since the rock formation served to lead the eye into the scene. I also like the movement in the water on either side of the rocks and I was also careful to include the left most rock formation in the frame since it gave the image more dimension and depth. An aperture of f/16 was used since the foreground was only about 2.5 feet from my camera and I wanted to have everything from the rocks to the horizon in focus. The image was taken around 15 minutes before sunset. Although there was a marine layer present, there were still some high clouds that were lit up by the setting sun. Fabulous shot – those rocks are amazing! Mary, if you get a chance, you should come down to La Jolla and paint a landscape. The natural beauty of the area is simply amazing. Good tips…..your composition is excellent….. Thanks for stopping by and for the comment Rob. Thanks. La Jolla is such a beautiful place that it is hard not to make nice photos there. Thanks. I am glad you found the tips useful. water and moody clouds always catch my attention, but the rock formation in this shot draws me in…awesome photo as always. One of these days I’m going to make a point to take photos half an hour before the sunrise/sunset…the lighting in your photos is always wonderful. Thanks Heather. It is totally worth the effort to eat dinner a little late or early to catch the good light. You will be amazed what it does with your photos. Beautiful moody capture with great light! I love the subtle colours and the texture of the rocks. Great choice of composition too! Must have been tricky keeping everything in focus with the foreground so close. Stunning shot – I think it’s one of your best. I love ND filters. I have only one myself, but I find it to be good value for the money. It can help the photo in different situations and it’s also easy to bring along. Nice shot, really like the composition…however, you have shown how important lighting is with your later sunset shot at this location (when the marine layer was light and the sun’s rays warmed the sky). Beautiful work yet again, Mark. Thanks. That is the cool thing about photography. You can go to the same location many times, but each time will result in a unique photo.